The machine is at Bliss's, grimly pursuing its appointed mission, slowly & implacably rotting away at another man's chances for salvation. I have sent Bliss word not to donate it to a charity (though it is a pity to fool away a chance to do a charity an ill turn), but to let me know when he has got his dose, because I've got another candidate for damnation. You just wait a couple of weeks & if you don't see the TypeWriter coming tilting along toward Cambridge with the raging hell of an unsatisfied appetite in its eye, I lose my guess. Please do not even divulge the fact that I own a machine. I have entirely stopped using the Type-Writer, for the reason that I never could write a letter with it to anybody without receiving a request by return mail that I would not only describe the machine but state what progress I had made in the use of it, etc., etc. I don't like to write letters, and so I don't want people to know that I own this curiosity-breeding little joker. ...I will now claim--until dispossessed--that I was the first person in the world to apply the typewriter to literature...The early machine was full of caprices, full of defects--devilish ones. It had as many immoralities as the machine of today has virtues. After a year or two I found that it was degrading my character, so I thought I would give it to Howells...He took it home to Boston, and my morals began to improve, but his have never recovered. - "The First Writing Machines"
...[children] what are they in the world for I don't know, for they are of no practical value as far as I can see. If I could beget a typewriter--but no, our fertile days are over. 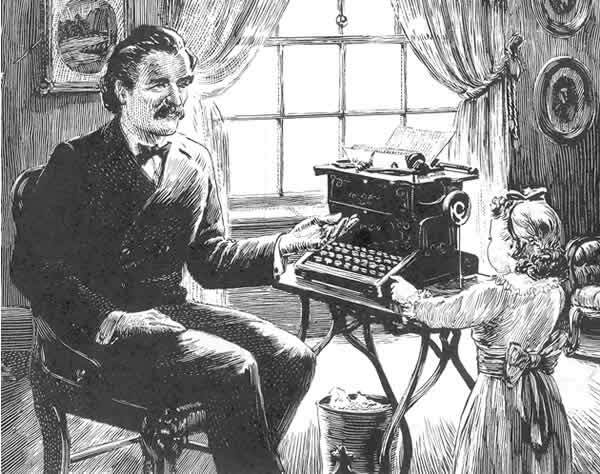 "Mark Twain had several typewriters. He was a pioneer in using the "Type Writer, a Sholes and Glidden that was manufactured by Remington, beginning in 1874. He regularly wrote letters on it, and he invested in it and personally promoted it. One of his books Life on the Mississippi was typed on it from his written manuscript by someone else. It was the first typed manuscript for a published book ever submitted by an author. 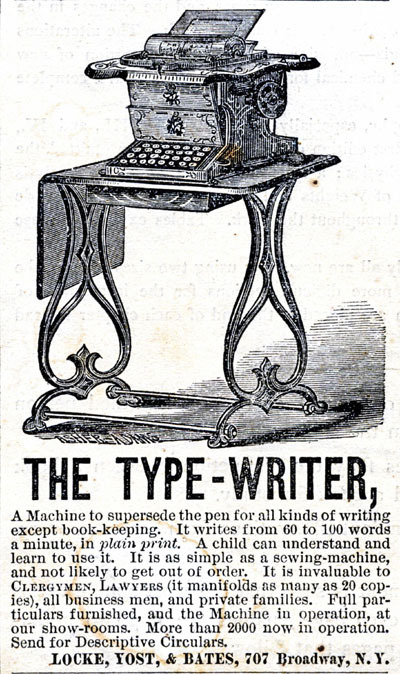 The Type Writer sent to Howells in 1875 was a Sholes and Glidden (see 1876 ad below)."